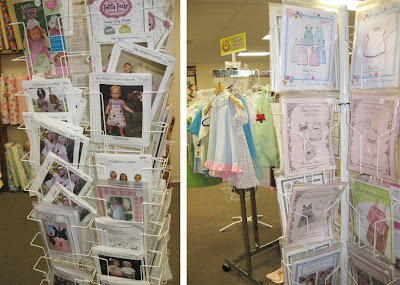 Children's clothes are popular DIY sewing projects for new moms, grandmoms, and those with new little ones in their lives (or the lives of their friends and family). Recently during my Blank Quilting fabric rep adventure, I visited three shops that specialize in children's garments, heirloom sewing and fabric projects to make for those people under the height of say, three feet tall. 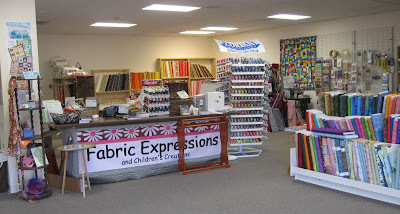 Fabric Expressions and Childrens Creations in Cullman, Alabama. 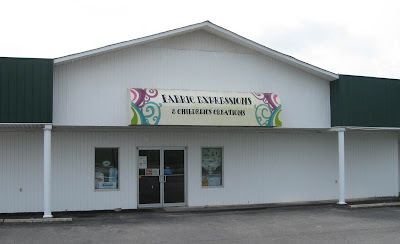 The first shop is Fabric Expressions and Childrens Creations in Cullman, Alabama. This shop is a Brother sewing machine center that also offers fabric and boutique children's clothing. Arlinda, the owner, and Melissa, are the two delightful women who operate the store. Fabric Expressions in Cullman, Alabama. 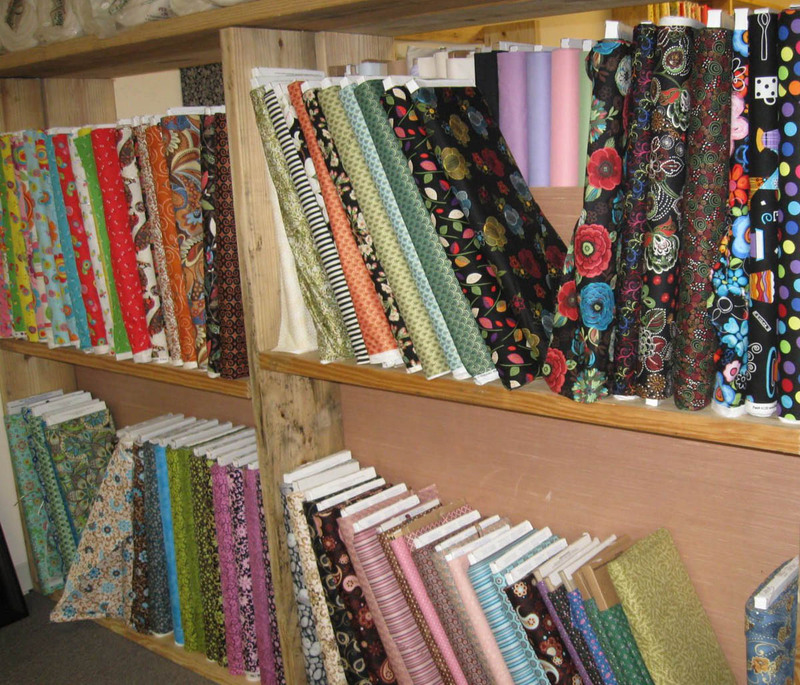 A selection of sdweing patterns for baby and children's garments. the ready-made boutique outfits that are on display at the shop. Melissa, the seamstress who makes the majority of these darling little outfits, has two fabric fashionistas of her own, Bailey and McKenzie (around ages 4 and 6). 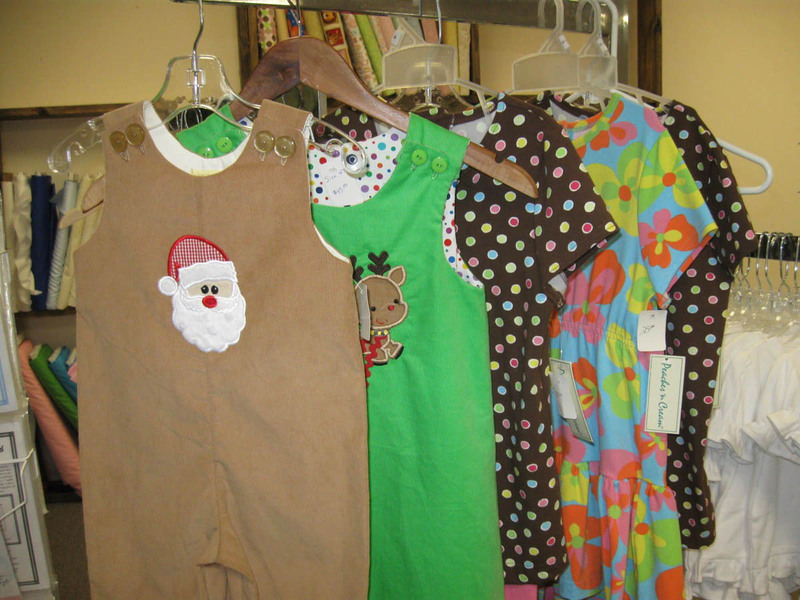 Ready-made jumpers and rompers are available for purchase. 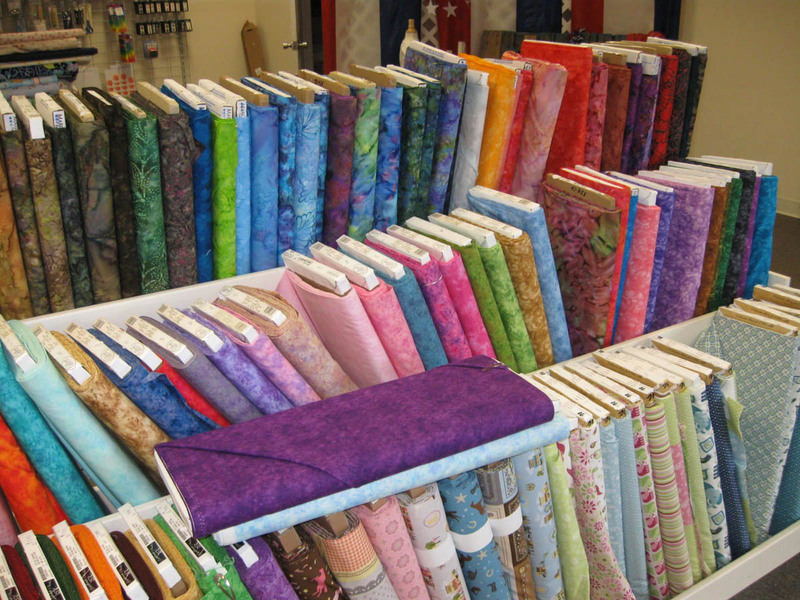 Fabric Expressions has a great selection of Splash blenders, Fusion Illusion, florals and prints in both bright colors and softer color palettes. 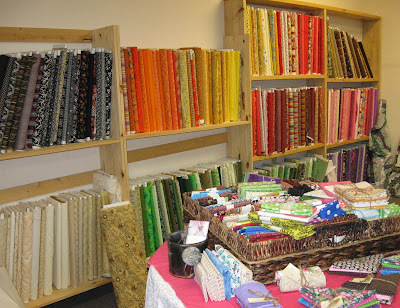 Batiks are also a favorite. Splash, Fusion Illusion and other blenders. A collection of bright prints, whimsical florals and coordinating stripes. 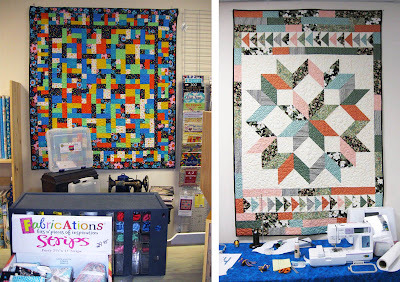 Several quilts were on display at the shop, including this colorful one (below left) featuring Blank Quilting's Big Bloom, a whimsical floral with large flowers and coordinating bubble dots and stripe fabrics. 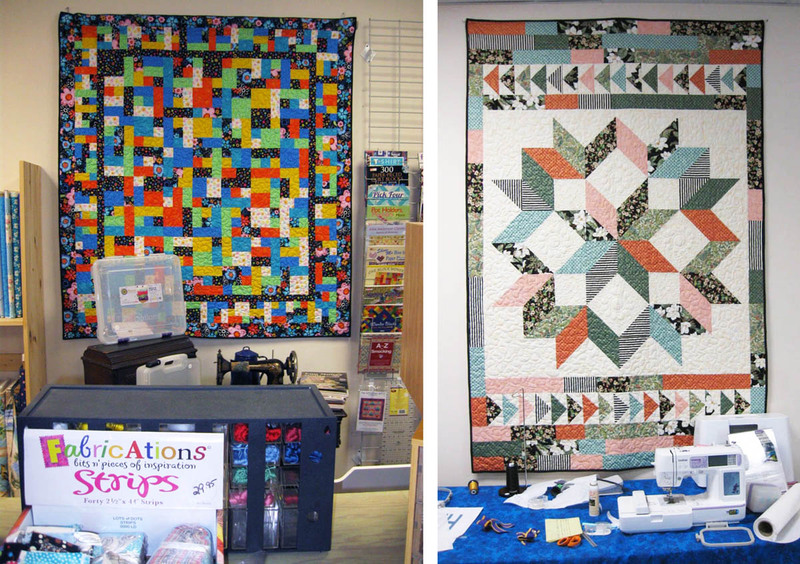 Pre-cut Fabrications packs are a preferred choice for quick lap-size or child-size quilts. Fabrications strips are great for quick quilt projects. A collection of black-and-whites, neutrals, collegiate themed fabrics and solids can also be found at this shop. Black/white prints, neutrals and baskets of fat quarters. Arlinda purchased this store from the previous owner and has been open for about a year and a half. 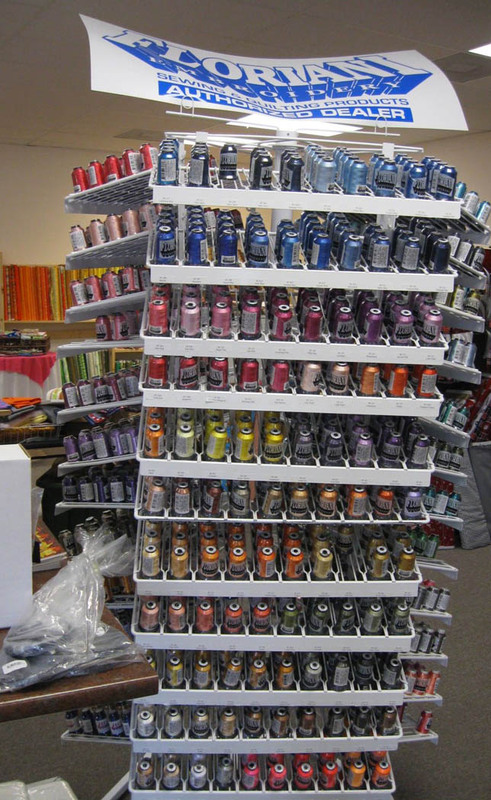 Under her ownership, she has added the Floriani line of machine embroidery threads and stabilizers and recently held a very successful event in her store. The large Floriani thread collection. Through the doorway from the main room is a large space for sewing machine guide classes and classes for sewing and quilting. 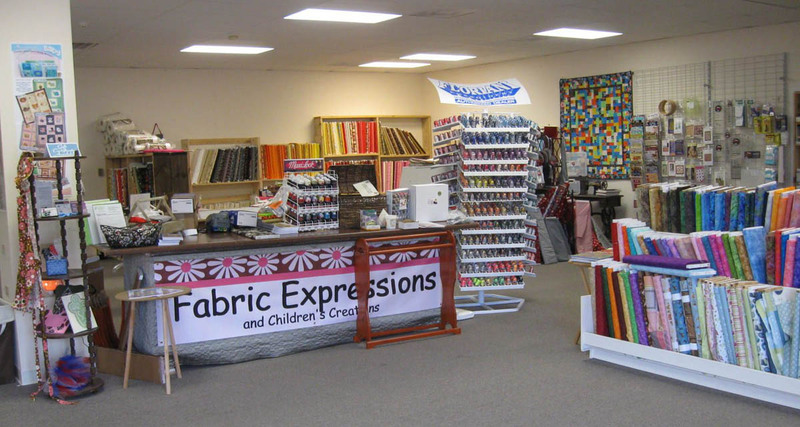 The owner and staff of Fabric Expressions have a deep joy and love for sewing and fabric and it comes through in their friendly personalities and exceptional customer service. Drop in for a visit and you will see for yourself. Fun prints, stipes, chevrons and plaids for children's garments and quilts. 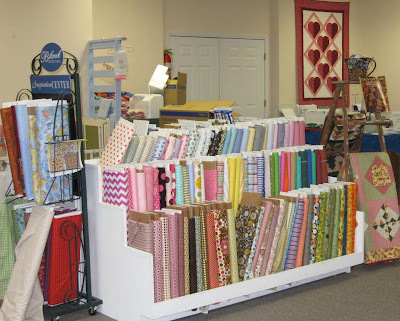 Stay tuned to my FiberAntics blog for more quilt and fabric shops in the Tennessee and northern Alabama area that focus on childrenswear and heirloom sewing projects.